Harry studies computer science at the University of Technology in Aachen, Germany since 1994. He came to Linux in 1995. Since then he plays around with it, always surprised about what a great piece of software it is. He programs a little under X, likes graphics and of course playing games. Other hobbies are: playing board games, reading SciFi, playing guitar (bad! ), cooking and practicing Ju-Jutsu. Tux Racer is a fast pace arcade game. 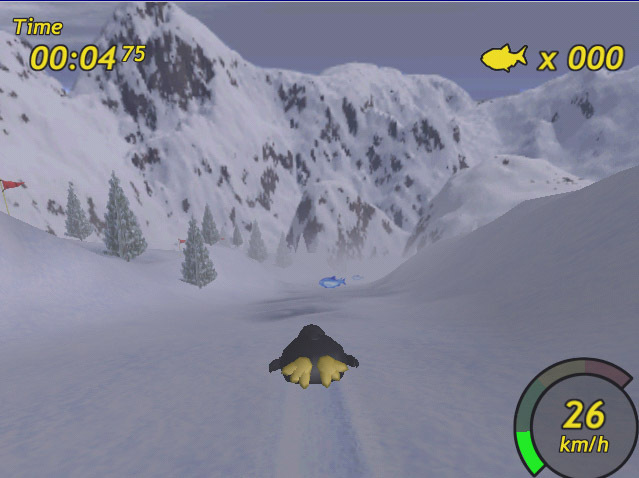 Our favorite Linux mascot has to slide down snow-covered hills, trying to catch as many herrings as possible and to finish the courses in time. Nice graphics, different courses (which are unlocked as you advance) and several (optional) weather conditions guarantee a lot of fun. The version tested in this article is 0.60.3. There are a lot of games for Linux in which Tux plays the role of the hero. Whether he is equipped with different kinds of weapon systems, seated in a kart, fighting the Evil Empire (located in the north-west of the U.S.), solving riddles or challenging quests (either alone or with helping friends), he is always quite busy in order to entertain the Linux community. This time he comes on his own, no equipment, no helpers, just him, the snow and the mountains. He takes part in a sporting event and boy, he is doing a great job! 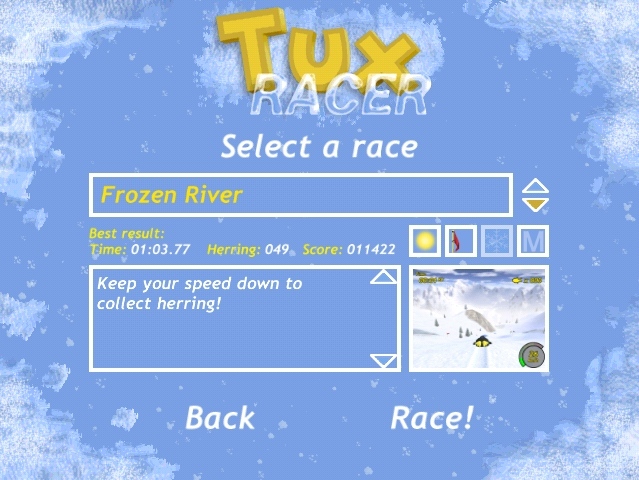 Tux Racer is a fast pace arcade game from Sunspire Studios. 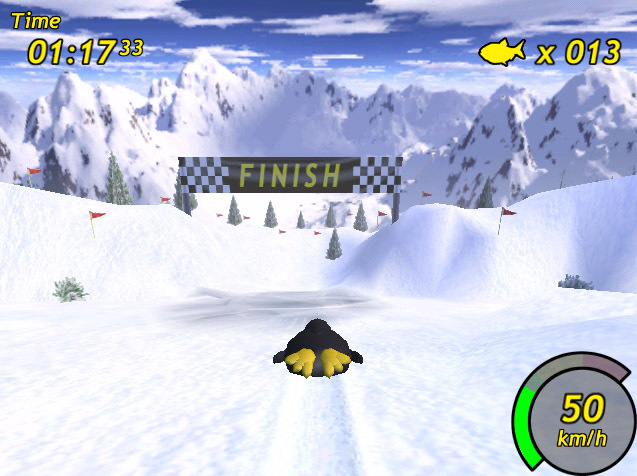 You have to help Tux mastering the courses, racing down snow-covered hills, collecting his loved herring, beating the clock. Nice 3d graphics, realistic physics and optional weather conditions provide a lot of fun for all people who prefer peaceful sporting challenges rather than bloody alien massacres. Tux Racer is open source. Therefore you can either get the source and the needed data files or decide to download precompiled packages from the Sunspire Studio website. Well, at the time of writing this article, the precompiled packages are promised but not really available. However, compiling the source shouldn't be a problem. Besides the source you will need another package with the game data. You will also find it at the download section of above mentioned website. By default Tux Racer expects those files to be located at /usr/local/share/tuxracer but of course this can be changed by editing the configuration file (more on that later). 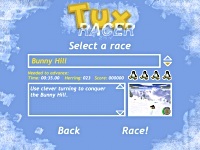 After everything just went fine, you can start the game by typing tuxracer. Well, as easy as it sounds compiling wasn't for me. Why? Well, after my first installation everything was fine - except for the music. The program told me that it wouldn't recognize the *.it music files. So, as Tux Racer uses SDLmixer for playing music, I started to dig into manuals and to surf websites... My current Linux distribution is SuSE 7.0. This one comes with SDL 1.1.2 and SDLmixer 1.0.5. So my first approach was to recompile the mixer library from the SuSE source package. Result: now Tux Racer segfaulted in one of the SDL routines. I had no idea what was wrong. However, I didn't give up but uninstalled all SuSE SDL packages and got the newest ones from the SDL website. I tried the RPMs and, well, it worked ! After starting the game for the first time, a subdirectory named .tuxracer/ will be created in your home directory. Navigating thru the game menu you won't find any entry like Options or Configure. Instead you will have to start your favorite text editor and adjust the config file .tuxracer/options manually. This is not very hard, as all entries are in plaintext. However, it would be a nice feature to change settings via the game menu and a quick look at the TODO list on the website shows us that this will become true in future releases. Several options can be configured in this options file, e.g. the path to the game data, window size, several sound and graphic settings. Every entry has some comments so it really shouldn't be difficult to tweak the file according to your needs. Take a look at it and play with the settings! As said before, your aim is to collect as many herrings as possible while trying to be as fast as possible. 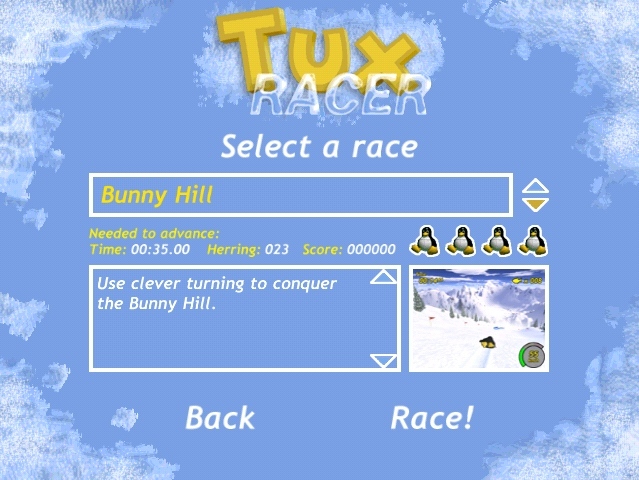 After entering tuxracer the game starts in full screen mode, however you can also run it in a smaller window. If you edit the config file and set another resolution, don't forget to disable fullscreen mode, or those values are reset after starting the game. Passing the start screen you get into the game menu. Here you can either enter competition or decide that your little penguin needs to practice. In the practice area you can select a track out of a large pool of courses. Additionally you can modify racing conditions like day or night race, wind, snow (future releases) or if the track should be mirrored. Some of the tracks provide some short summary describing their characteristics. 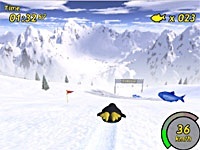 A lot of the tracks coming with Tux Racer were contributed by players. As soon as you think you can manage it, you can start with the real races. In the event area, you can't simply select the track you want to race. Instead you have to complete so called cups. Such a cup consists of several events (currently only one - the herring run) and you have to finish all races and events of a cup before you can proceed to the next one. 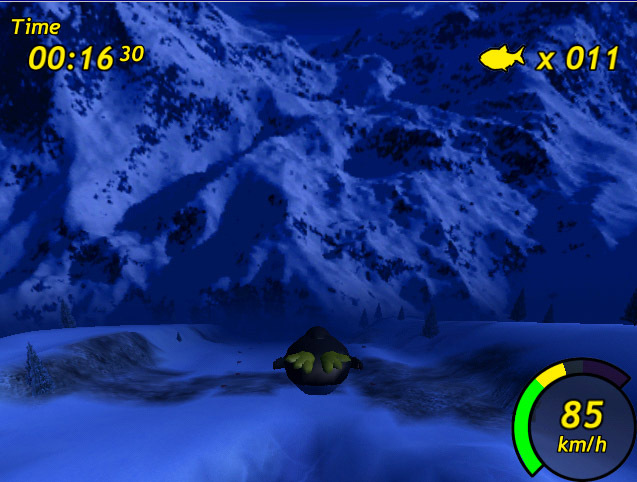 For each race there are certain conditions you have to meet, otherwise you won't advance, in other words, you have to reach the finish in time and collect a certain minimum of fish. Starting a race the view shows Tux from behind, sliding down the hills on his front. 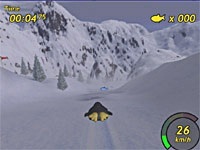 With the cursor keys you can steer him (left/right), accelerate(up) and break(down). Additionally the cute little black'n'white can jump (e). When breaking and hitting one of the turning keys (left/right), Tux does a sharp turn and slows down. If necessary you can "reset" the poor fellow with the backspace key if he got stuck somehow. If you don't like the keyboard control, you can either change key mapping or use a joystick. The course is marked with flags. Between those flags are several herrings that should be collected. I guess as soon as there are more events there will be more stuff out there than just fish. During the race you can here the wind whistle, depending on the type of ground the penguin is sliding, different sounds can be heard, same if turning or breaking or hitting a tree (ouch!). Tux's actions are lovely animated, whether you accelerate, break or turn. 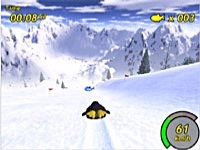 While heading down the hills, the penguin creates a track in the snow. If music is turned on, you are entertained during racing (maybe you should adjust the default values for music and sound in order to be able to hear wind and sliding). All in all you have four "lifes", that is you can fail three times, after the forth your advance ends. A nice detail is the fact that if you retry a course you just failed before, you can still see the old track you created in the snow. In the upper left corner of the display the elapsed time is shown, the number of collected herrings (only for the herring run event?) is shown in the top right corner. The so called energometer in the lower right corner shows the power Tux can use for a jump (height and distance). The more blue the circle becomes the more power the penguin has (by holding down the jump-key). Around the energometer the speed is shown in a graphical representation. The faster Tux becomes, the longer the indicator gets and changes its color from green to yellow and finally to red. For all those who like to have easy to use instruments the speed is also shown in numbers. Finally the current frame rate is shown on the lower left corner, indicating how smooth the game runs. After finishing a race you get some stats (time, collected items) and get informed whether you advanced or failed and have to try again. Tux Racer is a lovely game, it provides nice detailed graphics, sounds and music. There are several different tracks to challenge. There are still some flaws, for example right now there is neither a multiplayer option nor can you compete with computer opponents. But these issues can be found in the list of future improvements, so let's hope they will be implemented soon. Same is with the possibility to change settings from within the game via menus. There is another "problem": performance. On my box which is an AMD K6-3 with 450 MHz, a TNT2 M64 card, XFree 4.0.1 and Nvidia's GL drivers, version 0.95, I achieve framerates between 8-14 frames per second (with default settings in the config file), depending on the window size/screen resolution. By changing graphics settings I could slightly improve the framerate but didn't experience a real breakthrough. All in all this game is worth the effort to be downloaded, compiled and installed. For all of you out there, looking for some fun, go get the game ! More comments from the Linux community at the Linux Game Tome.